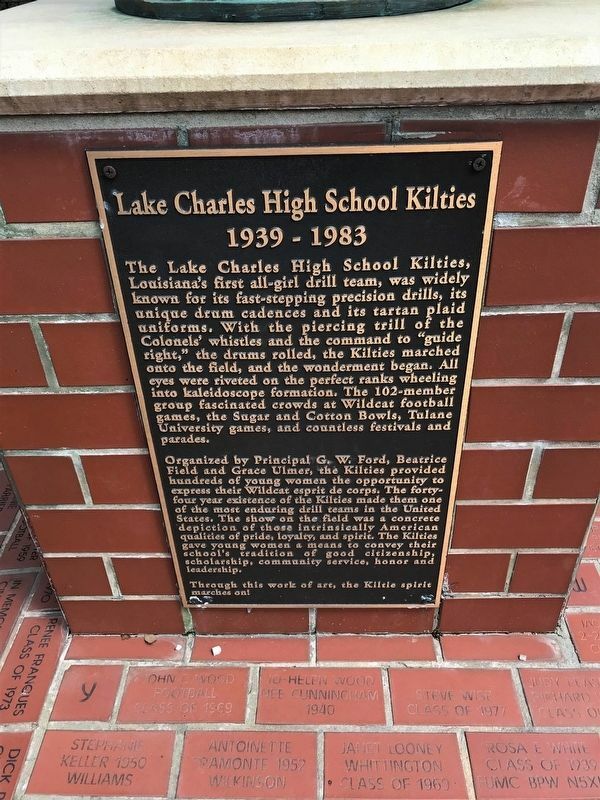 Lake Charles High School Kilties. The Lake Charles High School Kilties, Louisiana's first all-girl drill team, was widely known for its fast-stepping precision drills, its unique drum cadences and its tartan plaid uniforms. With the piercing trill of the Colonels' whistles and the command to "guide right, the drums rolled, the Kilties marched onto the field, and the wonderment began. All eyes were riveted on the perfect ranks wheeling into kaleidoscope formation. The 102-member group fascinated crowds at Wildcat football games, the Sugar and Cotton Bowls, Tulane University games; and countless festivals and parades. Organized by Principal G. W. Ford, Beatrice Field and Grace Ulmer, the Kilties provided hundreds of young women the opportunity to express their Wildcat esprit de corps. The forty- four year existence of the Kilties made them one of the most enduring drill teams in the United States. The show on the field was a concrete depiction of those intrinsically American qualities of pride, loyalty, and spirit. 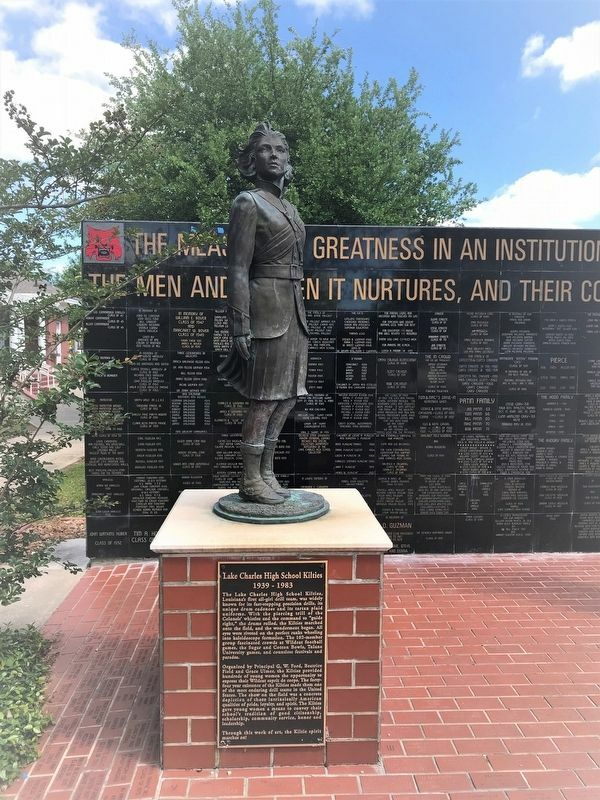 The Kilties gave young women a means to convey their school's tradition of good citizenship, scholarships community service, honor and leaderships. The Lake Charles High School Kilties, Louisiana's first all-girl drill team, was widely known for its fast-stepping precision drills, its unique drum cadences and its tartan plaid uniforms. With the piercing trill of the Colonels' whistles and the command to "guide right, the drums rolled, the Kilties marched onto the field, and the wonderment began. All eyes were riveted on the perfect ranks wheeling into kaleidoscope formation. The 102-member group fascinated crowds at Wildcat football games, the Sugar and Cotton Bowls, Tulane University games; and countless festivals and parades. of art, the Kiltie spirit marches on! Location. 30° 13.166′ N, 93° 13.095′ W. Marker is in Lake Charles, Louisiana, in Calcasieu Parish. Marker is at the intersection of Seventh Street and Bilbo Street, on the right when traveling west on Seventh Street. Touch for map. Located in the Lock Park. Marker is in this post office area: Lake Charles LA 70601, United States of America. Touch for directions. Other nearby markers. At least 8 other markers are within 2 miles of this marker, measured as the crow flies. St. Charles Academy (about 300 feet away, measured in a direct line); Lost Railroad Stations (approx. 0.3 miles away); The Arcade Theatre and Miller Building, the Paramount and the Weber Building (approx. 0.6 miles away); Louisiana Baptist Orphanage (approx. 0.6 miles away); Killen Field (approx. one mile away); Goldband Studio (approx. 1.2 miles away); Ball's Auditorium (approx. 1.8 miles away); LaGrange High School (approx. 1.9 miles away). Touch for a list and map of all markers in Lake Charles. More. Search the internet for Lake Charles High School Kilties. Credits. This page was last revised on April 12, 2018. This page originally submitted on April 12, 2018, by Cajun Scrambler of Assumption, Louisiana. This page has been viewed 63 times since then and 9 times this year. Photos: 1, 2. submitted on April 12, 2018.